Let's have a look in Alex's cupboard! ...and an unusually detailed chocolate model of a chimpanzee. What? There was some rice and some instant cup noodles in there too. Sapporo’s internationally, globally, world famous Snow Festival kicked off this morning with an opening ceremony that featured “Miss ~ from all over Japan”. I haven’t been down to check it out yet, and I’ll have to live with the disappointment of missing that cavalcade of lovelies, but I can at least bring you news from the build up last weekend. 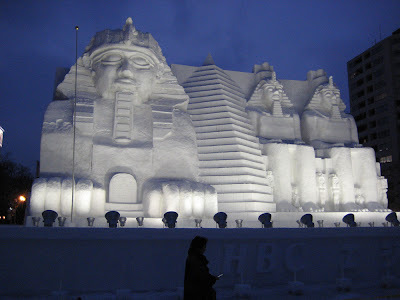 Sapporo Snow Festival apparently attracts over two million visitors a year. Sapporo is a city of around one point seven million people. Now I’ve expressed scepticism about this in the past, but here I’m going to go right out and call shenanigans here. Where the hell could we possibly fit all those people? Today someone said “Yes, but Sapporo does have a lot of hotels”, which is true, but does it have a hotel district BIGGER THAN THE REST OF THE CITY? Christ on a bike. I was in town on Saturday and Sunday though, and the large number of tourists was pretty apparent. It’s not like I’m the only Caucasian in the city here, but certainly I don’t see all that many white folks in my average week. This weekend there were loads of them as soon as I got off the train. And while there’s a natural snobbishness (that I’m not going to deny) that you get about any city in which you live, it really didn’t bother me all that much. UNTIL that is, I was in a tiny, tiny vintage shop where the woman at the counter asked me in Japanese if I was in town for the Snow Festival. Putting aside the fact that if I were in town for the Snow Festival I probably wouldn’t have understood her, I replied “No… I live here” in a kind of crestfallen way. Oh well, it was an awesome shop, and the whole time I was in there she seemed to be giving a Ukulele lesson to another woman who was standing at the counter. Seriously. On any other day that would’ve easily won the day’s medal for best shop, but I also managed to stumble upon a bookshop that sold both new and ancient, second hand children’s books, art and design books, fabulous stationery and a bunch of other things. The shop was on the third floor of some no-mark building off the beaten track, and I talked to the owner for ages, as he had excellent English from working in New York for two years as a butcher (!). His stock was endlessly fascinating, and I should probably write a whole piece sometime about the appetite for travel and assimilation of western culture that allows you to strike up long conversations with Japanese people in a way that foreign nationals never could in the UK or America. I also bought a phenomenally cool mechanical pencil from the Czech Republic. Sweet! Wait… I was going to talk about the Snow Festival I think. 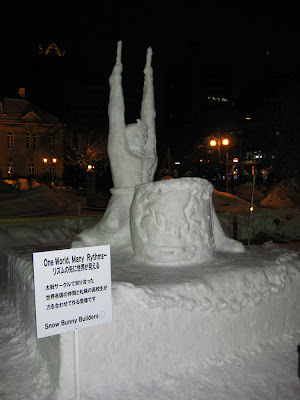 So even more awesome than going shopping was the fact that I got to help out with Jesi’s Snow Sculpture, which was one of the small blocks of snow that they allocate to the citizens of Sapporo. There are 120 citizens sculptures altogether, and they are raffled off to people from a list of 600 entrants. Of course most teams consist of half a dozen members, and they all enter in order to secure a block. Jesi entered all on her own and scored spot number 112 of 120. I helped out for maybe three hours in total, and frankly I take little pride in it, as both times I only actually turned up to apologise in person for not helping out, only to actually end up helping out. Still, check out all the pictures; those wrists and the drumstick in his right hand… all me baby. It was fun, and we felt a little special as we got a lot of double takes from Japanese people who didn’t expect to see any foreign people making snow sculptures. The only other foreign non-pros that I saw were the US NAVY team. Our sculpture was better than theirs. A massive number of citizen’s sculptures are cartoon characters and company mascots, which is really very sensible since those characters are mostly large blobs with other blobs attached. A pretty safe bet for snow sculpting. They have to open up some of the blocks of the park to allow the citizens to get access to their sculptures, so I probably saw most of the big statues last weekend and they’re all pretty cool. I’ll be going down again in the next couple of days to have a proper look, but as everyone says – it will be very cold, there will be too many people, and I will catch flu and die. My question for all of my students this week is “Are you going to the Snow Festival” to which the answer is 95% NO. For the people of Sapporo this whole thing is just a week long inconvenience. Lets knock this on the head with my favourite Snow Festival trivia right now. Firstly while the main Snow Festival site is in Odori Park, the park that runs for a dozen city blocks across the centre of the city, the big sculptures are actually placed carefully slightly to the west. This is because there’s an underground mall to the east of the park, and the massive weight of a large snow sculpture would crash through the ceiling and destroy the wonder that is Aurora Town. Secondly the Snow Festival is actually smaller now than it was a few years ago, not just because they’ve had a run of years with poor snow, but because of Japan’s increased military presence on the global stage. 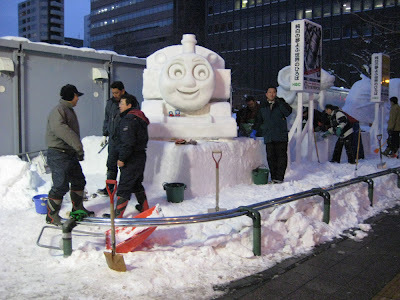 Apparently the Hokkaido SDF base sent troops to Iraq a few years ago, and as the SDF has always been one of the main contributors to the Snow Festival there were suddenly less people to make the massive sculptures. Is it shallow to make a joke about that being yet another reason to hate the war in Iraq?